Many regions of the country have experienced particularly rough winters so far, and there's more snow to come. It seems as though every week some area or another gets buried under snow. While this can be an annoyance to those who need to get places regardless of the weather, it can also be an opportunity for your organization to raise some money. No one wants to shovel snow, but paying for a plow can be an expensive proposition, especially if the snow is falling once a week. Since time immemorial children have filled this need. A group of three or four school children can shovel a driveway and sidewalk in a decent amount of time, and will charge less than the plow. Of course, this requires that your organization involve and benefit children, but if it does then their labors can help raise money. You'll need a few things to make this work, but one stands out above the rest. Rounding up a group to shovel snow takes plenty of organization, so you'll need a point person to take care of everything. This can be a parent from your organization who is particularly good at organizing on short notice. If you're going to hold a snow shoveling fundraiser you'll need to get started early, before people resign themselves to shoveling the driveway themselves. The first responsibility is to stay on top of the weather situation. This includes not only monitoring the forecast, but also checking with the school district for cancellations. It's unrealistic to expect children to shovel driveways on a school day, so it will take at least a delayed opening, and likely a full cancellation for this to work. The point person also has to implement a phone chain so that everyone in the organization can be contacted as soon as possible. Shoveling drives require coordination, and the quicker the better. A phone chain usually helps the process move faster, but someone has to draw it up and make sure that it is executed. If your organization is large enough you can divide up the operation among many different neighborhoods. This will require multiple vehicles. The easiest way is to assign drivers beforehand, and have them pick up other organization members in the area. The point person comes into play here again, because someone has to coordinate which groups go to which neighborhoods. If the goal is to shovel as many driveways, and therefore raise as much money, as possible, it's important to ensure that there are no overlapping assignments. 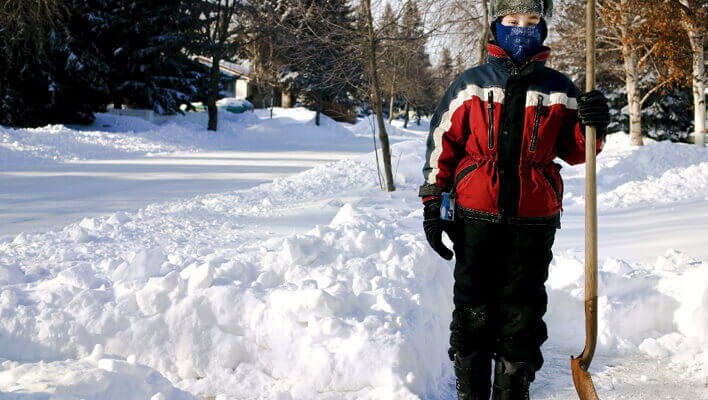 A snow shoveling drive presents children with an opportunity to learn about sales pitches. It's easy enough for parents to knock on a door and ask if the resident would like his or her driveway shoveled by these enterprising children. But to have the children make the pitch makes them appear enterprising. They're also much more likely to elicit a Yes response. After the shoveling is done and the neighborhoods are cleared of snow, you should have raised a decent amount of money for your organization. Best of all, the children involved will feel more a part of the group, because they earned that money.